One of the best elements of the playwrights' collective known as The Welders is that each production bears the stamp of a different artist, one with their own unique voice that is, by design, one among an ensemble of artists. With In This Hope: A Pericles Project, Hannah Hessel Ratner is the producing playwright and lets her dramaturgical mind lead the way, leading us into a theatrical world that's fascinated by story, place, and connection; in some ways, it's a very dramaturgical play, riveted by themes and ideas and specific knowledge and insight. It's also, however, the kind of play that is created new with each performance, thanks to the shades and nuance that each audience brings with them. 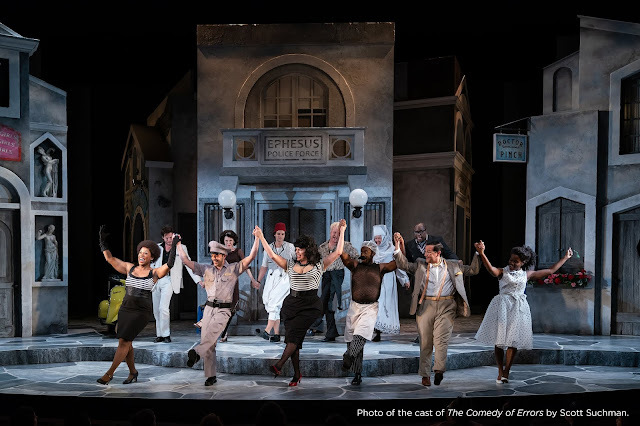 Pericles (Raghad Makhlouf) is caught in the sea as created by the ensemble (Lida Maria Benson, Lori Pitts, and Rocelyn Frisco). Photo credit Teresa Castracane Photography. Pericles, Prince of Tyre is a perfect starting place for a project like In This Hope, with its provenance as a collaboration, likely between Shakespeare and another playwright named George Wilkins (the current leading contender). Pericles is a story of personal diasporas and separations, refugees and reconciliations, and In this Hope weaves elements of that story in with the stories of the artists creating the production. Under the guidance of director Anna Brenner, actors Lida Maria Benson, Rocelyn Frisco, Raghad Makhlouf, and Lori Pitts share the story of the Prince of Tyre alongside stories of their own. With environmental design by Colin K. Bills, the audience is seated in a circle, surrounded by maps of key places in Pericles' narrative and a configuration of ropes tying disparate points of the room together. Actors share stories with the audience in equally shared light, and Pei Lee's costume designs use simple bases and long, looping infinity scarves to create character while retaining our ties to the actors themselves. 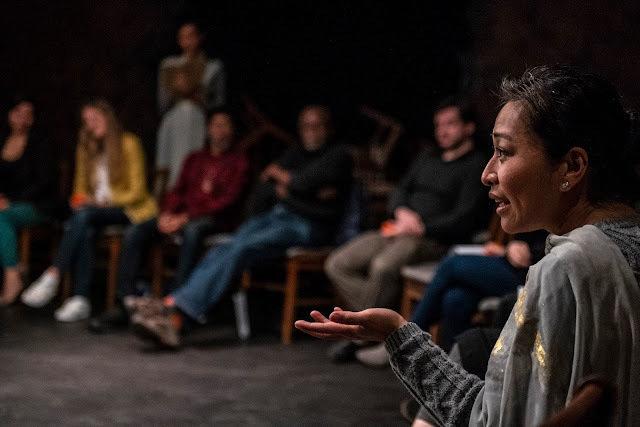 There's a pervasive sense of constantly tuning into the audience, not just through direct address, but as actors ask the audience to make connections to their own lives, or to share a memory or a moment with another audience member. I'm going to spoil the intermission break and tell you that Welders are on hand with hot beverages for the audience to share in the kitchen. And about that--the audience actually enters the theatre space through the kitchen of the Universalist National Memorial Church. Church kitchens are generally designed for service to others, either to their church community or to the greater community beyond, and that sense of welcome and care for others is a key component of the world of the play. Rocelyn Frisco shares a story with the audience. Photo credit Teresa Castracane Photography. That sense of care ultimately follows the shape of Shakespeare's Pericles, a play of immense suffering and loss that manages to end with grace, reconciliation, and hope. We see and share Pericles' story as well as other stories of family, memory, journeys to far away places, and ever-shifting ideas of home, but ultimately, the audience is sent out with tangible messages of hope. Come together for a few hours, the production asks, and we'll share stories, cider, citrus, and even a little Shakespeare. 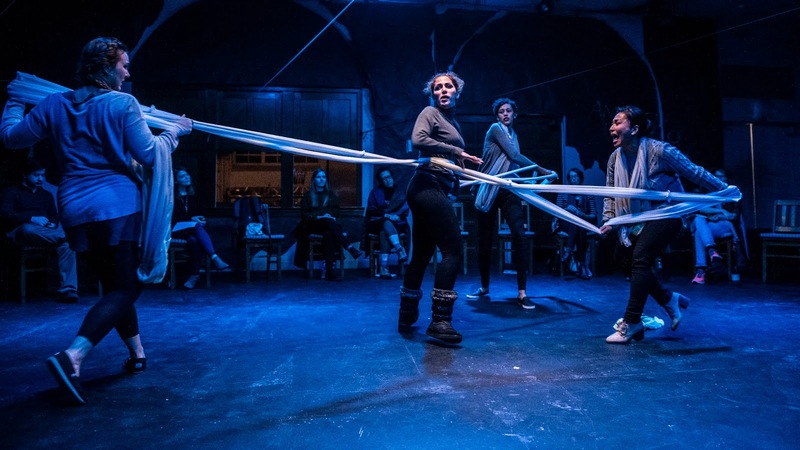 After all, there's a reason why we come back to certain stories again and again, and Hannah Hessel Ratner's play gives us the space to see and share those stories together. Note: I worked alongside Hannah in 2011 for a month as my internship at STC was ending and her tenure as Audience Enrichment Manager was just beginning.